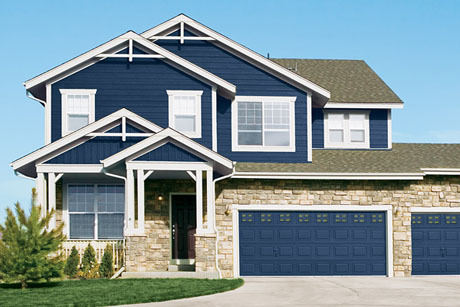 Our featured siding and trim product and the one we recommend is LP SmartSide Trim & Siding. The LP Smartside family offers a complete line of exterior trim and siding - including lap, panel, trim, fascia and soffit - all engineered using advanced siding technology to give you the traditional look of real wood, while helping to protect your home from harsh weather conditions and termites. Every step of the manufacturing process is designed to create a high-performance siding that's tough and durable, so it performs beautifully for decades, and is backed by the best warranty in the industry ..
From LP Products: LP SmartSide products combine the beauty of cedar with the highest standard of performance. Our proprietary SmartGuard process helps prevent delamination, moisture, rot and termite damage, and our products are 100% silica-free. Each step of the manufacturing process is designed to create durable siding that will perform beautifully for decades. The proprietary SmartGuard process uses zinc borate to resist termites and fungal decay. This treatment is impregnated throughout the substrate of all products which are then factory primed to add yet another level of protection against moisture. LP SmartSide products come backed with one of the most competitive warranties in the market today: A 5/50 year limited warranty provides a 5-year, 100% labor and replacement feature and a 50-year warranty on the product.